It is not intuitive to seek beauty in art deemed grotesque/weird, but most authors who produce horror/fantasy actually are usually (a) serious about their craft, and (b) driven my strange muses. 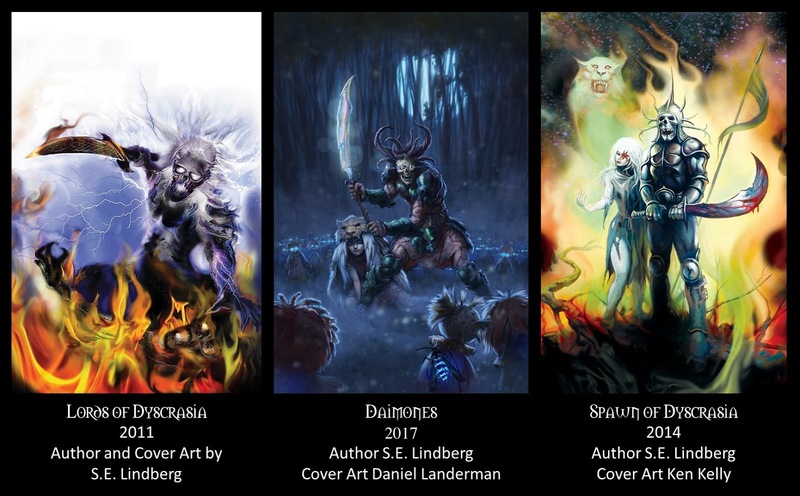 These interviews engage contemporary authors & artists on the theme of "Art & Beauty in Weird/Fantasy Fiction." This one features Jerome Stueart, author of many books including The Angels of Our Better Beasts S E Review (Link). Let's learn about his muses...and his Better Beasts! Jerome Stueart is a writer and illustrator whose work has appeared in Lightspeed's Queers Destroy Science Fiction, Fantasy, Tor.com, Geist, Joyland, Icarus, Tessaracts anthologies, and other journals and magazines. He is a Clarion 2007 grad, a Lambda Literary fellow, a Milton Fellow and a Fulbright fellow--meaning he's a queer science fiction/fantasy writer of faith who has dual citizenship in Canada. He co-edited Wrestling with Gods and Imaginarium 4. His next book is a novel, One Nation Under Gods, from ChiZine Publications in June of 2018. His Patreon with loaded extras (illustrations and scenes) can be found under JeromeWStueart. He most recently moved from the Yukon Territory, and now lives in Dayton, OH. 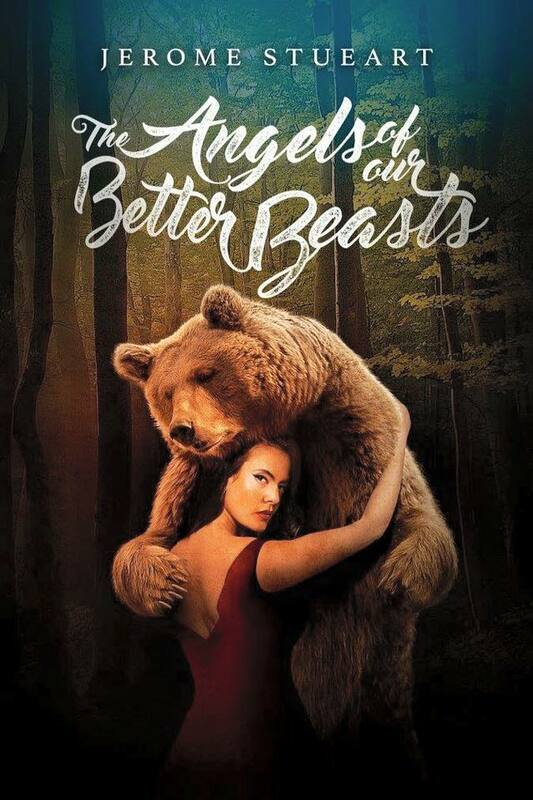 SEL: The Angels of Our Better Beasts invites readers to reconsider what it means to be a human (angel or beast). Most are weird, fantasy and sci-fi tales, and the relationships span the gamut from lemming-to-researcher, to husband-to husband, and wife-to-husband, etc. The variety is great and writing evocative. Please identify/discuss your own angels and beasts. Are these your muses? JS: Thanks, Seth. I think animals are the muses of many people---they seem so wise (because they can't talk) and so we give them the words we think they should say. I've often believed that writers who include animals in their works usually make them wiser than the people. I was also one of those kids that went and made friends with your dog before I made friends with your kids or you... I felt very comfortable with a pet. As for beasts, yeah, growing up mine was a werewolf. I used to think of him as a mentor---if I could just find him, or he find me. I think I still feel compelled to explore the relationship we have to beasts--both animal and monster--in stories. Are these our way of trying to reach a higher plane of wisdom or morality? Or our way of trying to escape civilization and become more wild? Certainly our pets give us a bridge to the animal kingdom--and many stories that have animals as a focus try to make us better people through those animals. Maybe our monsters are trying to help us too. SEL: You illustrated the whole book too! 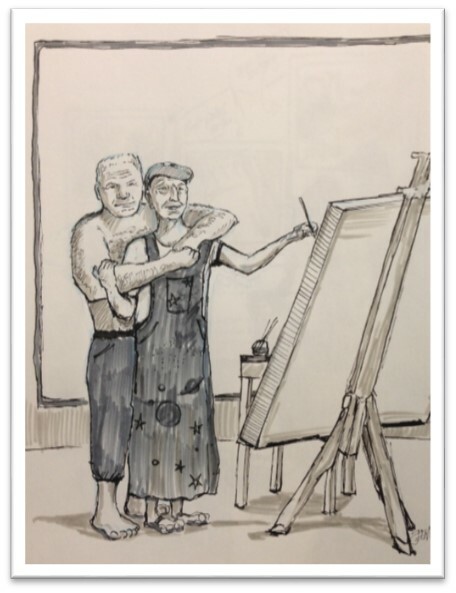 How does your drawing and writing work processes interplay? JS: I usually do the illustrations after I do the story. In fact, I mapped out the illustrations on a sheet to see if I could do something interesting with them when they are together. Kind of evoke different themes. I tried that! LOL. I had the first column focus on inanimate objects: the box of ashes, the bottle of wine, the heart on the table, the gold; the second column do a close up of people in relationship; the third was to show movement; the fourth got all messed up--it was supposed to be about body parts: hand, foot, and well, a canyon and large gorilla got in there [see inset image]. So that failed. But I still think they work in harmony somehow. 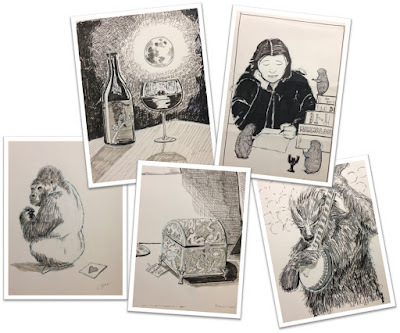 Whenever I do illustrations I try to capture the essence of the story: wonder for "For a Look At New Worlds" and disembodied horror for "The Moon Over Tokyo" and the weird juxtaposition of a werewolf playing the banjo, not necessarily a scene from the story (as the werewolf doesn't play the banjo in his werewolf form). I also had fun with imitating famous works of art or poems. My box of ashes tries to echo Keats' "Ode to a Grecian Urn" and the illustration for Bondsmen is "James Bond descending a staircase" --- hey, I try to keep it fun. 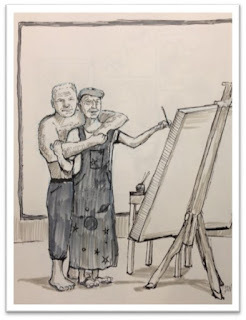 I had the most trouble trying to illustrate "You Will Draw..." because I wanted to emphasize the relationship--but once I had the figures, I didn't want to muddy the background. So I settled on a sort of blank canvas, or window behind them. The story might be better served, but I didn't want to give away any surprises. 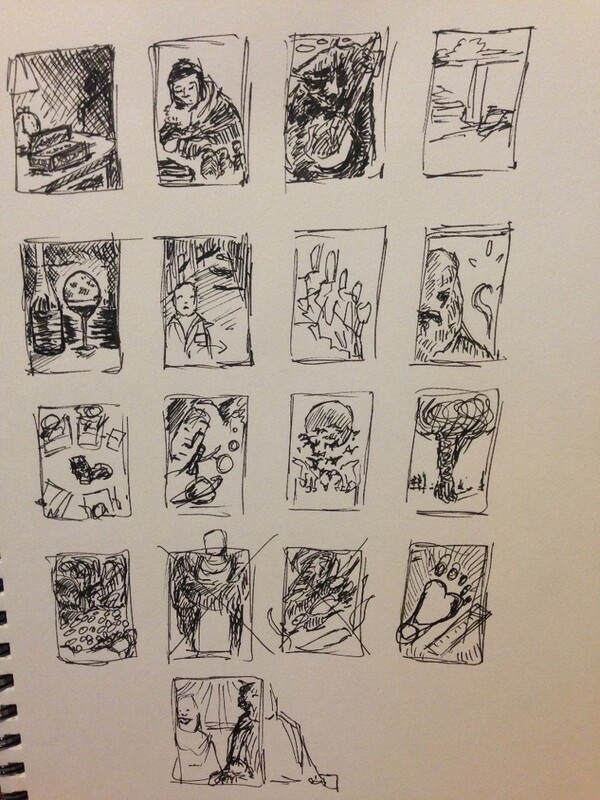 And doing the art of the main character--who is a famous artist--felt daunting. To pretend to be one of his illustrations, my art needed to be amazing, and I wasn't at his caliber--so I settled for a portrait of him. SEL: Are you secretly a changeling or hybrid/chimera? JS: Well, technically, I'm a changeling because I'm adopted (if you're referring to the babies switched by fairies idea), but I think of myself probably more as a chimera--a mixture of things and ideas. I'm not one kind of writer, and I don't have one kind of theme or style. This collection is me trying to show all sorts of ways to tell a story. I'm going to be hell for an agent someday, but I love trying new things and seeing what kinds of stories and styles I can do. JS: The interviewer in the story is trying to ask the question: should artists be political? Should art try to influence society? And my character, Auguste Renault, just laughs and you never hear his answer. The story, though, is his answer. He truly believes that one should use fame to help others out. Much of art is political. Is ALL art political? Well, Renault was doing portrait painting and paintings of cities for most of his career. I made him like the Sargent of his era, and Sargent did a lot of portraits of the wealthy and of his friends, and some of it was scandalous. He painted actors! At a time when having one of his exquisite portraits meant you had "made it" into the wealthy class, he deemed to give them away to authors, friends, actors and actresses--he used his talent to give equal status to rich and poor. Renault turns his art to the miners of Ganymede--and at first this is seen as it is with most artists: that their subjects are the poor, and they are making a statement to remind the rich of the poor. But in Renault's case, his subjects got their paintings for free, and the rich are upset that they can't see Renault's work--or that his work starts becoming the only source of news when the strike is not covered by the media. In my own opinion, art is an excellent way of speaking truth---sometimes the perfect illustration encapsulates a change that is needed, a flaw that is nearly hidden, or even model a way of being. It is the purpose of art to bring truth and beauty and yes, controversy, and wisdom to society. There is a place for beautiful flowers and landscapes to bring peace to a troubled world--but isn't that influencing society too? SEL: At World Con 2016 in Columbus OH (Writer-Artist Panel coverage link) you shared the history of Angels Of Our Better Beasts. Can you recap that here? Did the drawings come before the tales? JS: I wrote the stories over the last ten years or so. I found the stories I loved best--the ones that seemed to work--had a beast in them, or a monster, or something someone might think was a monster. Something that made us afraid, or made us wonder, or connected us to animals in the sense that we wanted to listen to them. So I put the collection together--most of it and proposed it to ChiZIne and they liked it. I then wrote a couple of stories for it, and decided to illustrate it too. So definitely the illustrations came afterwards--and that process is something I spell out above. A cool blog post recapping all the Better Beasts is here (link)! Jerome Stueart's Better Beasts - for fans! SEL: You have been known to draw personalized “beasts” for fans. Is that like doing a tarot card reading? JS: HAHA. No. But it was enlightening to me what they wanted as a beast. And I think it was enlightening to them too. 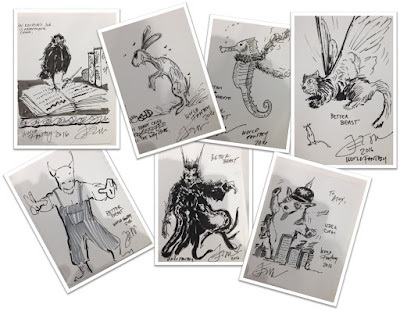 Many just wanted to see their beasts "come to life" and so they had crazy wonderful requests. It was a good way to build a rapport with my readers--or with people who just fellow beast-lovers! Here are a few of those beasts people wanted. SEL: Do you find your own art “weird” or “beautiful”? JS: I think my work is weird, but I strive for beauty. I strive for harmony and balance in composition. Even as it is weird. I do not always love my own art, but I do find I work hard at creating something that will be nice to look at. Or a good illustration of the story. In many ways my stories are trying to make the weird beautiful. I want to move a reader to care about a beast, or to consider that the beasts are beautiful. My vampires in "How Magnificent" are beautiful in their perfect takeover of the medical profession, their efficiency, their marketing. My werewolf hopes that the beauty and power of his Christian music can overcome the horror of his mistakes, his primal nature. He does not see anything redeeming about being the werewolf--only that it must be contained. There is beauty in the mandalas of "For a Look at New Worlds" and in their fragility. There's a lot of art in this book--- whether it's the young king who will be a better king because he is artistic, or the artist who tries to use his fame to help others, or the writers who try to make sense of their lives... so many of these stories are a statement on the place of art in the world. SEL: Any future endeavors to share? JS: Well, I'm finishing up a story about sisters and their rival gods, and another one about a chef on a starship. I'm also writing One Nation Under Gods--my alternate American history with religious nationalism--and two kids trying to escape to Canada. You can see more about that on my Patreon page (https://www.patreon.com/jeromeWstueart). 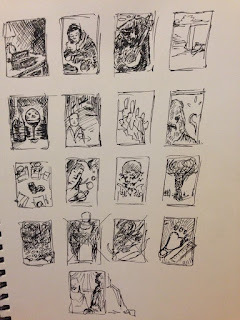 For a couple of bucks you can see the illustrations I'm working on for this novel. It comes out from ChiZine in June of 2018.